Welcome to the BoBounny blog today! 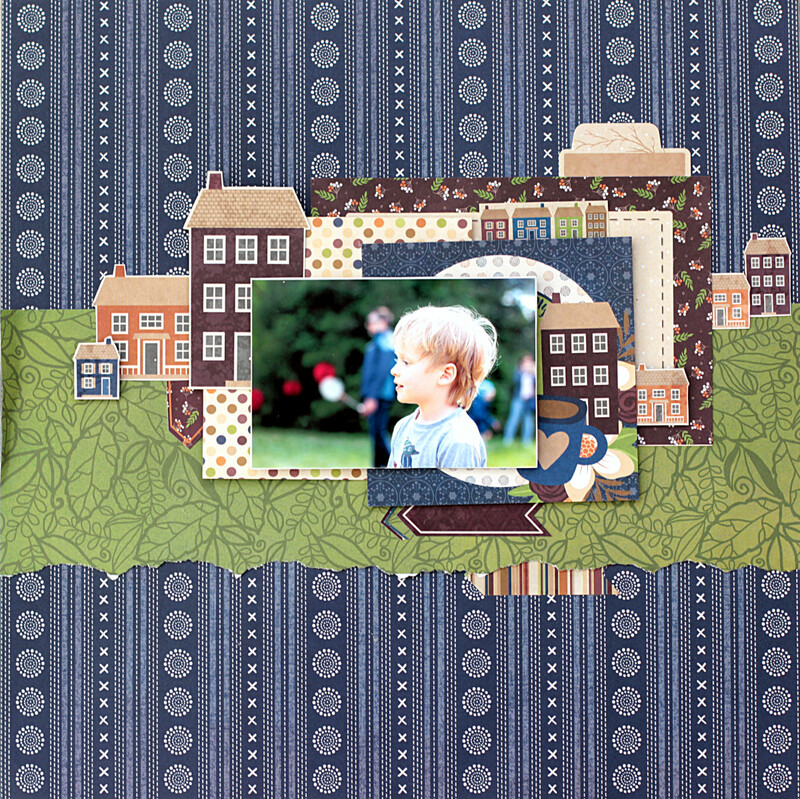 It's me, Elena here with you today to share this 12 x 12 simple scrapbooking layout I designed and created with the new Stay Awhile collection. My favorite thing about the Stay Awhile collection is the clean lines, tone on tone patterns and of course the deep, cozy colors and homey sentiments. The perfect all-occaision line, it really makes it simple to tell a story in my layout. I especially love creating BOY themed layouts with this line! 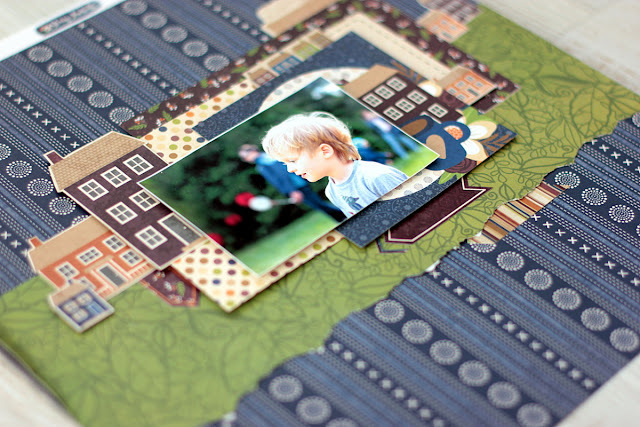 To show how simple and easy it is to create my page, I haven't used ANY embellishments. 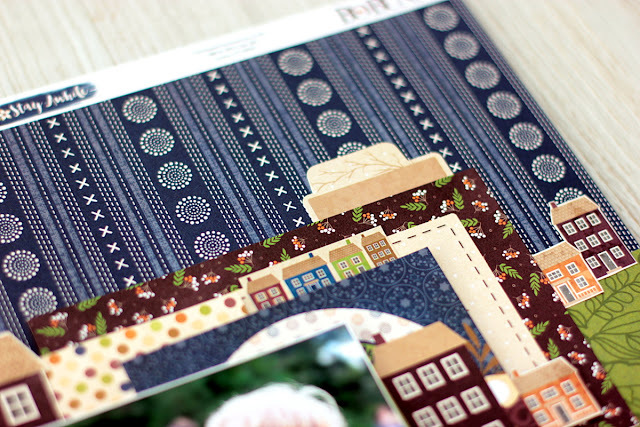 I trimmed and pieced together a few paper layers - mixing patterns, dots and stripes, then cut out a few houses from the paper to give this the look of a countryside village. I started with tearing (purposely kind of uneven and rough) a long strip of green paper and then mixed mostly the cut out cards for my layers. Then, I trimmed little bits of other accents from the papers too. I like the deep blue, plum, burnt orange and brown colors this collection has and it's quite easy to create a simple but dynamic look with your project. To keep my layout simple I decided against adding a full title. I added only the tab sticker to add the date later. Wanted to be certain the focus is is on the one photo of this sweet little boy. For the finishing touches, I added some sticker arrows for an extra splash of color and design! These little elements are always just right! 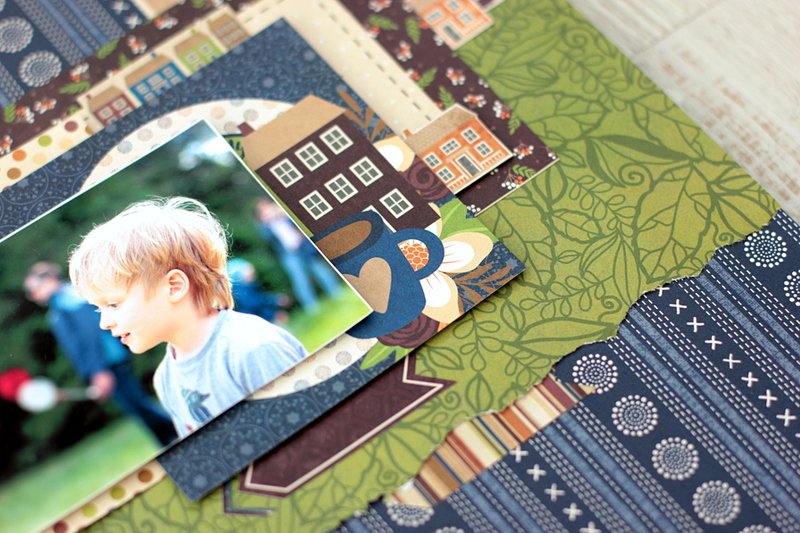 Thanks for stopping by today for this "Simple Scrapbooking" idea featuring Stay Awhile! 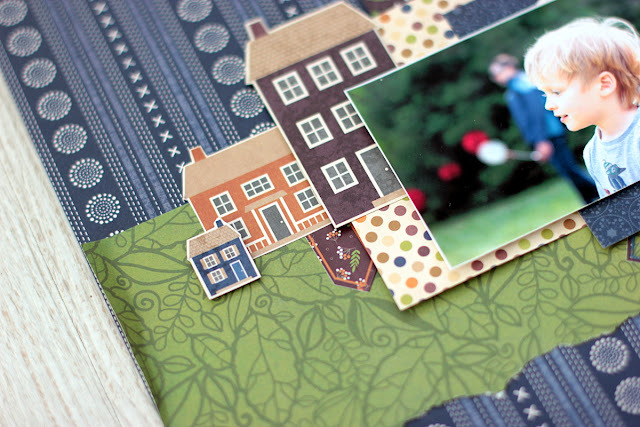 Be sure to come and visit us again for more fun ideas and paper crafting inspiration!